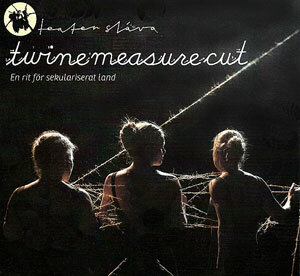 This is first a trailer from Twine. Measure. Cut and also the whole show filmed and cut by Amrit Fors. The performances was made with Teater Sláva in 2013 in Huddinge outside Stockholm and it later played on tour starting first 2014. This entry was posted in Micke's videos and tagged blog, blogg, bulgarian singing, festive rites, Kompani Komedi, Memento mori, Micke Klingvall, nornor, norns, norse gods, norse norns, physical theatre, rite, rites, rituals, scandinavian theatre, skuld, swedish theatre, theatre, urd, verdandi, women in theatre, ygdrasil. Bookmark the permalink.